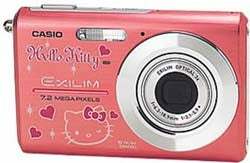 Some Casio Exilim 720's have gotten dressed up by their cruel, older sisters in wuss gear. Rebranded the Hello Kitty Camera, the device still takes 7.2MP pictures, but it's been covered in pink and stickers and evilness. AND during startup, the camera makes weird, gross Hello Kitty noises and shows weird, gross Hello Kitty pictures. For those into weirdness, the Japan exclusive will run you $400. Go pick one up while your friends plan the intervention/your long-term disappearance.